Another quarter of 20% earnings growth is likely on tap. Consensus estimates are calling for a 21% year-over-year increase in S&P 500 Index earnings for the quarter, setting up a second-straight quarter of 20%+ growth. Should results come in ahead of expectations as we expect, it would mark the 37th consecutive quarter of earnings exceeding expectations. Tax cuts, strong manufacturing activity, a weaker U.S. dollar (versus the year-ago quarter) and higher oil prices all point to strong results, as we discuss in today’s Weekly Market Commentary. While tariffs have dominated headlines, we do not expect trade to have much impact on overall results. With 87 S&P 500 companies having reported, the season is off to a good start: 84% of companies have exceeded earnings estimates. As always, guidance is key. During earnings season we will be closely following companies’ guidance and movement in analysts’ earnings estimates. In our recently released Midyear Outlook 2018: The Plot Thickens, we increased our S&P 500 earnings forecast for 2018-from $152.50 per share to $155, an almost 18% year-over-year increase over 2017. The increase was driven primarily by strong first quarter results, but economic data received during the second quarter pointed to an even stronger backdrop for corporate profits than we had anticipated. While our $155 per share forecast is below the consensus estimates of $160, we prefer to be conservative due to the potential for further U.S. dollar strength, wage pressures, and tariff-related costs. GDP report highlights the week of data. Bloomberg consensus gross domestic product (GDP) forecast has risen to 4.2% for the second quarter. Markit’s global purchasing manager’s indexes, the European Central Bank meeting, and trade talks (NAFTA and European Commission) are also scheduled this week, in addition to the busiest week of second quarter earnings season with 175 S&P 500 companies scheduled to report. 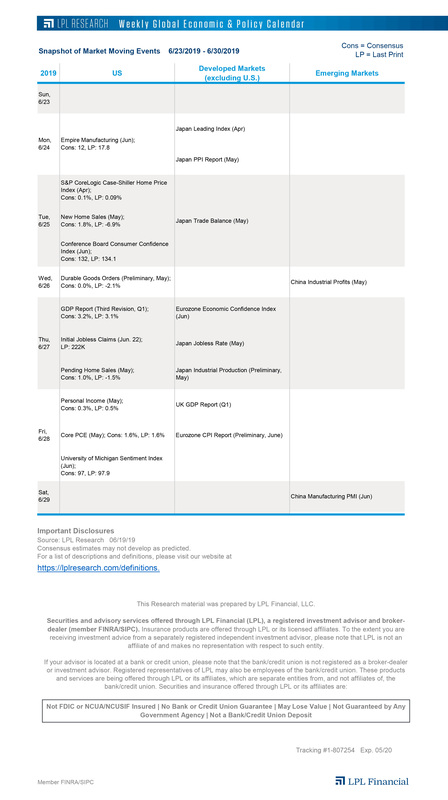 View all the key events on our Weekly Global Economic & Policy Calendar. GDP preview. Consensus expectations show that Friday’s first look at real GDP for the second quarter could be the strongest reading since 2014. On today’s blog (and this week’s Weekly Economic Commentary), we examine the catalysts behind last quarter’s economic growth activity, including the benefits of fiscal stimulus and a jump in exports.